Personal protective equipment manufacturer Alpha Solway has launched the innovative Alphachem X150 disposable coverall for workers requiring clothing protection against Type 3 and 4 chemical splashes and sprays. 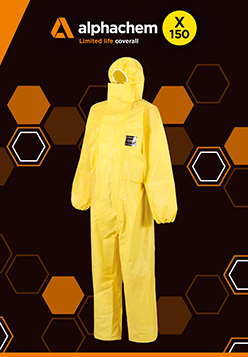 Providing an effective barrier against a range of commonly used chemicals within industry sectors such as agriculture, petrochemical, waste management, utilities and food manufacturing, the new Alphachem X150 is a light, durable and cost-effective coverall. Certified to EN standards including EN14605+A1:2009, EN14126:2003, EN13982-1:2004+A1:2009, EN1073-2:2002 and EN1149-5:2008, the new X150 is manufactured using a lightweight HDPE fabric combining exceptional levels of protection, safety and durability with high levels of wearer comfort. Wearer comfort and convenience have also been built into the new X150 in the shape of elasticated ankles and wrists as well as a 3-piece hood, designed to remain in position in line with movement of the wearer’s head ensuring a clear line of vision at all times. The two-piece crotch pattern also provides an improved fit and enhanced freedom of movement. “The X150 is a fantastic addition to our Alphachem range of protective coveralls. The level of chemical protection provided, combined with high levels of wearer comfort deliver real performance and safety features in a limited life coverall solution for a wide range of industrial applications,” said Nick Moore, Product Development Director of Alpha Solway.